Well, that was one draw, where a point was snatched from the jaws of defeat, that actually felt like a loss to me as I walked away from the ground. 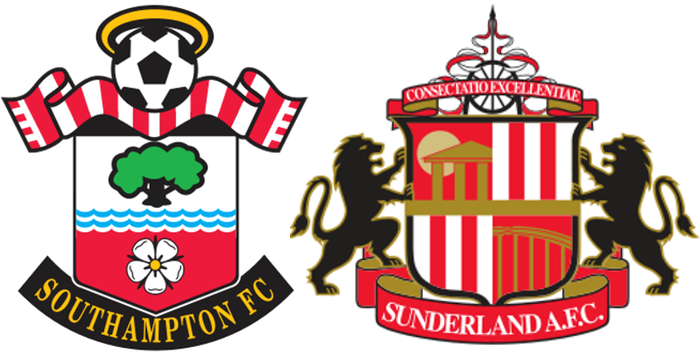 It was not that Sunderland were very good, they just outfought Saints, just like Bournemouth did earlier in the week. This Southampton team do not like to be pressed, which they were, and hard. Unlike the Bournemouth game, which was played cleanly with not a single player being booked, this one was played with the Sunderland players using every trick in the book to niggle and frustrate. Unfortunately, the referee did little, or nothing to stop it. The main talking point before the game was not who was in the starting eleven, but one of the youngsters who was on the bench. I very much doubt if more then a handful of fans knew anything about Olufela Olomola, but there he was warming up on the pitch and a muscular athletic player he looked, with a heck of a shot on him. A first team player for the future maybe? The pattern for the game was set as early as the 8th minute, when Bertrand was booked. Sometimes when players are booked so early, it cramps their style of play, as they are always mindful that one wrong move will end up with a second yellow and a sending off. In his case it did no such thing and he went on to have a decent game. One Sunderland player who caught the eye, was the tall number 27 Kirchoff, who was winning a heap of possession in the midfield and turning it into attacking moves. Fortunately, those in front of him were nowhere near his quality and apart from one horrific moment on the half hour when van Dijk gave away a free kick and got himself booked. The resulting kick was taken by Khazri, who whipped the ball in from the left corner of the penalty area and caught Forster flat footed, but the big man got just enough of a touch to push it onto the angle of the far post and crossbar. Fortunately for Saints, Sunderland were not quick enough to react and the rebound went harmlessly away. 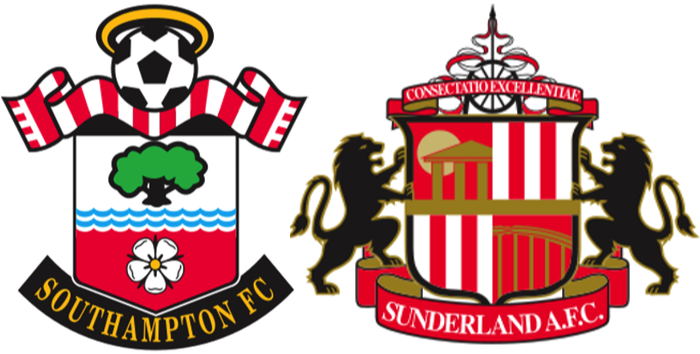 Even with all Sunderland's efforts, it was still the home side who looked more threatening, but as with so many other games this season, it was at the sharp end that Saints were lacking. Thanks to injuries, Koeman was forced to play Tadić, Pellè and Mané across the front, all of whom are out of form at the moment and it showed. How this game was crying out for Shane Long's movement to unsettle the defenders. Just before van Dijk's booking, Saints had probably their best chance of the half. Mané chipped a ball into the Sunderland penalty area, which was headed down by Pellè and Tadić mishit a shot into the ground, that then headed towards the back of the net, only for Mannone to tip it over the bar. Half-time came with Saints probably the more grateful to hear the half-time whistle, with the score still 0-0. The talk around me during the interval, was how Saints looked strangely out of sorts one minute, unable to string a couple of passes together and then really sharp and effective the next. Romeu was clearly the most effective player on the pitch for Saints and I think that he has turned out to be one of the best of last summer's signings. Martina was also exceeding our expectations, looking good coming forward, but was being let down by his final cross into the area. The second half began, as it finished with Saints struggling to make any sort of impression on the Sunderland defence. Rather ominously the away side were now starting to look dangerous and Borini managed to land the ball on the roof of Saints net, after he had intercepted van Dijk's headed clearance. Even so, it was almost on the 60 minute mark before Forster was called on to make his first meaningful save, doing well to push away a shot from Borini. Shortly after, Koeman reacted by taking off Jordy Clasie and Steven Davis, replacing them with Ward-Prowse and Juanmi. Both Clasie and Davis had had decent games, but this was clearly an attempt to try something different. They have an almost immediate impact and Pellè is presented with Saints best chance of the match so far, when he controls a pass from Juanmi, but then scuffs the attempted shot and it is easily blocked, leaving the Italian holding his head in his hands. He knows he has messed up a good chance. There is then a sustained period of pressure from Saints, with Ward-Prowse driving the team forward. However, the match bursts into life in the 79th minute when Fonte hauls down Borini right in front of the penalty area and leaves the referee with no alternative, other than to show Fonte a straight red for a last man foul. Koeman reacts, by hauling of Mané and replacing him with Yoshida. Shortly after there is scrabble in the Saints penalty area and the ball finds it's way to Jermain Defoe, who makes no mistake in curling the ball beyond Forster. There are only five minutes of normal time left and it looks all over. The Sunderland fans think so anyway. Much to everyone's surprise, Saints raise their game and start to look far more effective than they had for the preceding 85 minutes. How come they couldn't play like that before. van Dijk in particular looks well wound up, getting very agitated when the referee fails to give a corner. Then in the 3rd minute of injury time, Tadić on the left, cuts back into the penalty area to find van Dijk arriving to plant the ball into the back of the net, with a strike that any forward would be proud of. Saints fans go mad! Unbelievable. For all the excitement of the equaliser in stoppage time, as I walked back to the car, I couldn't shake the feeling that this was a game that the team just did not start playing until they went 0-1 down. Europe is probably a lost cause now and all we can hope for is to finish as high as we can in the league, which will probably be the same as last season and we regarded that as a success at the time. Oh yes, my MoM was Virgil van Dijk for just not giving up. There was an element of "If the guys up front are not going to score, then I guess I will have to". Top man.